It will come as no surprise to the readers of this blog that The Legal Genealogist is … well … um … a law geek. And thinks that every genealogist should make reading the law, learning about the law, even loving the law, part of one’s daily research practices. Still, there are going to be times when we’re all going to need to dive in, deeply, to research a question in our family history that’s utterly dependent on the applicable law — and that law will be nowhere to be found online. So… what to do? Where might we find the research materials, and maybe even get some help in using them? Here’s a hint. 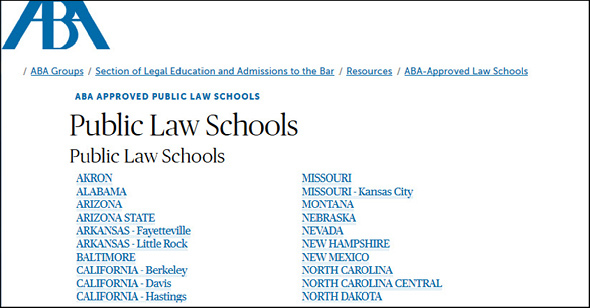 Head over to the Public Law Schools page of the American Bar Association’s website. Because the majority of public law schools are open to — ready for it? — the public. That’s you and me, folks. And that page lists 85 public law schools around the country starting with the University of Akron in Ohio and ending up with the University of Wyoming. Now I started looking at this for a presentation this Saturday to the Virginia Genealogical Society’s Spring Conference at the Four Points by Sheraton-Richmond Airport. (You are coming, right? registration info is here), so the first ones I looked at were Virginia’s three public law schools. • At the Wolf Law Library of the William & Mary Law School, the answers to the Frequently Asked Questions make it clear that “Members of the general public are welcome to use library materials within the library.” In fact, residents of Williamsburg, James City County and York County can even get a library card at a whopping cost of a whole $5.00 that lets them check out circulating books. The Law Library at the University of Akron has no reference to public access on its website, which is a little frustrating since a search of its help system keeps turning up the phrase “Available on campus for the public” and linking to pages where the phrase doesn’t appear. The bottom line: While not all public law school law libraries are fully — or even partially — open to the public, the majority are available for our use. So we should always check out the closest one when we need to research the laws behind our family history. After all, they really aren’t all online. Cite/link to this post: Judy G. Russell, “blog post title,” The Legal Genealogist (https://www.legalgenealogist.com/blog : posted date). I spent many an hour in our county courthouse law library during my years of practice. Although mostly used by attorneys, it was and is open to the public. Our county law library is open to the public and has good resources. Also UC Berkeley’s Law Library is open to the public.